language and ideas presented in this book are lyrical and noteworthy. This is the story of a famous self-help author who no longer believes in his own advice. We are taken on a journey of his past and what has led to his disillusionment as well as a present journey propelled by an unexpected visitor to his Martha's Vineyard home. The language and ideas presented in this book are lyrical and noteworthy. Self-help writer Eric Newborn's motivational books have spawned a legion of devoted followers who swear that his ideas have pulled their lives from the brink. But after Eric can't save his own wife from dying, he finds himself at a loss -- the power of positive thinking is simply not enough to overcome his grief. Retreating to the home he and his wife shared on Martha's Vineyard, Eric, with his dog as his closest companion, attempts to distance himself from the teachings he has come to hate. But when a woman named Sam shows up at his door one night five years later, Eric must finally confront his heartache and reconcile his worldview with the pain he has suffered. 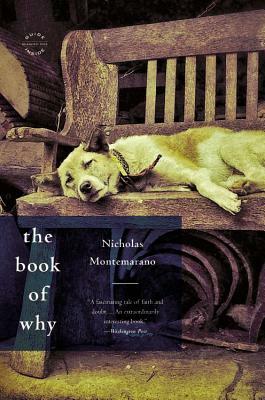 At once a powerful love story, a stirring portrait of a soul laid bare by grief, and a celebration of coincidence, connection, and the belief that true love never dies, The Book of Why explores the deep powers of the heart and mind to shape the world around us, blurring the lines between loss and love, fate and free will, despair and joy. Nicholas Montemarano is the author of a story collection, If the Sky Falls (a New York Times Book Review Editor's Choice) and a debut novel, A Fine Place. He is Associate Professor of English at Franklin & Marshall College in Lancaster, PA.
"Love and death: our two greatest mysteries. Not many writers have the guts or the skill to take them on at the same time, but Nicholas Montemarano has both. With The Book of Why, he's managed a seemingly impossible feat-using language to delineate, with great compassion and precision, that which appears ineffable." -- Ron Currie, Jr., author of Everything Matters!